Olympiacos Piraeus rallied for a 73-78 victory over Fenerbahce Ulker Istanbul on Friday night at Fenerbahce Ulker Sports Arena to move closer to a playoff spot. 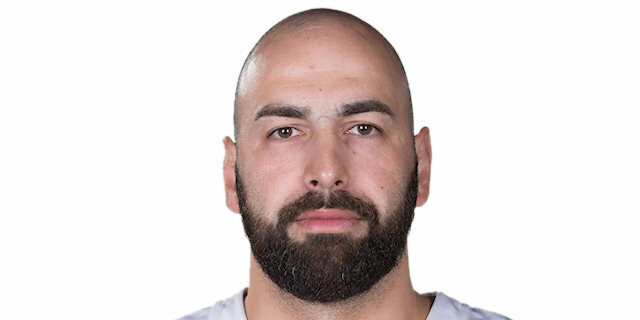 The hosts enjoyed an 8-point edge early in the fourth quarter, but the defending champs answered with a 0-13 charge –taking the lead for good on a Vassilis Spanoulis three-pointer. 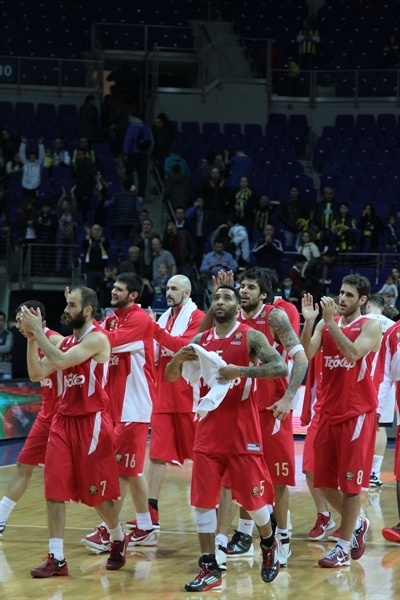 Fenerbahce kept it close till the final minute, but Olympiacos was cool down the stretch. The Reds improved to 8-5 with the win and tie Maccabi Electra for second place in Top 16 Group F, though neither has clinched a playoff berth yet. Fenerbahce Ulker dropped its sixth straight game as its record slipped to 2-11. Spanoulis finished with 14 points and 7 assists for the winners, while Kostas Papanikolaou had 16 points on 4-of-4 three-point shooting and Georgios Printezis, who surpassed the 1,000-point milestone in the opening quarter, added 12 points. 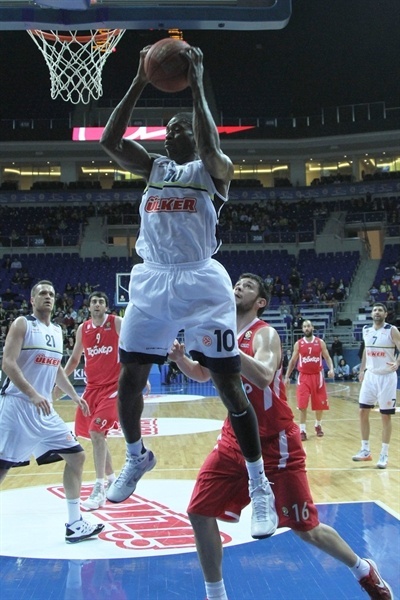 For Fenerbahce Ulker, Romain Sato, Omer Onan and Bo McCalebb scored 12 points apiece and Kaya Peker had 10. Sato opened the scoring on the offensive glass before Papanikolaou drilled a triple and Spanoulis scored in transition to put the Reds in front. The hosts regained the lead on a McCalebb layup, 6-5. An Oguz Savas basket-plus-foul and a pair of Sato free throws boosted the lead to 11-7. Spanoulis fed Giorgi Shermadini twice – once underneath for a slam and then in transition to draw a foul and tie the score from the line. 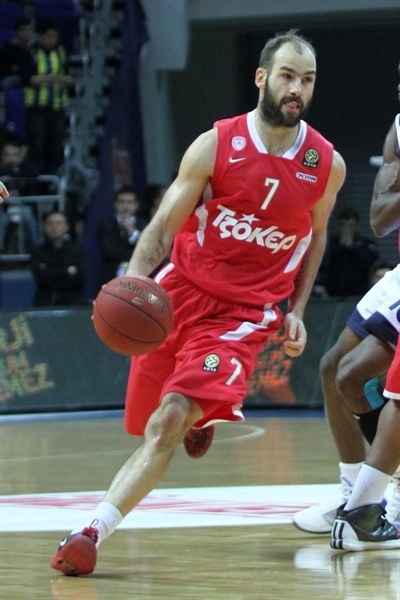 Georgios Printezis crossed the career 1,000-point threshold as Olympiacos went up 11-13. Papanikolaou lobed Josh Powell for an alley-oop layup and Kostas Sloukas tacked on a pair of free throws to make it 13-19 after 10 minutes. 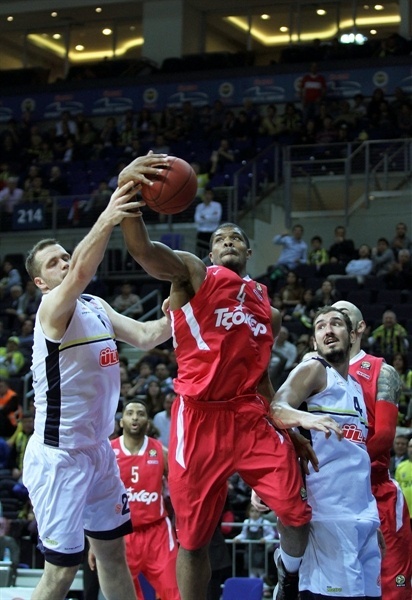 Emir Preldzic drove the lane for a score and Mike Batiste beat the 24-second clock as Fenerbahce stormed back. 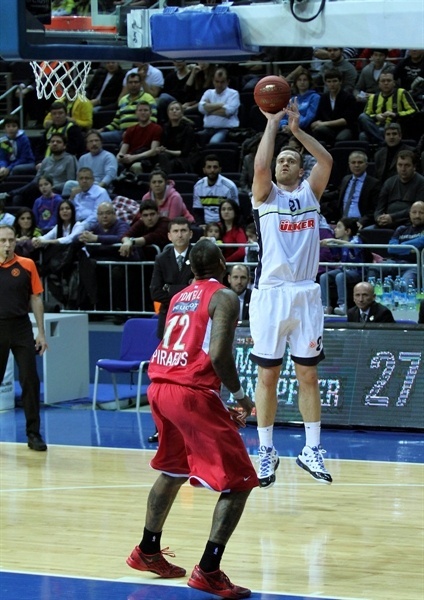 Preldzic fed Peker, who scored through a goal-tending violation to put the hosts ahead 22-21. Perperoglou responded with a jumper. Peker was whistled for an unsportsmanlike foul while stopping Kyle Hines at the rim. The possession proved to be worth 5 points between Hines and Spanoulis for a 22-28 edge midway through the quarter. Preldzic used a behind-the-back dribble to get to the rim for a layup. Preldzic whipped a perfect pass to Baris Ermis to bring his team within a basket. Peker, first with a floater and then a point-blank layup thanks to Ermis’s deep pass, tied it and then put the hosts ahead 2. Pero Antic changed that with a three-pointer. Oguz Savas and Acie Law traded buckets before Ermis grabbed an offensive rebound and nailed a jumper on the buzzer to make it 34-33 at the break. The hosts opened the second half with a highlight as McCalebb delivered the ball on the money to Ilkan Karaman for an alley-oop slam. Papanikolaou evened the score with a triple, but soon a Karaman three made it 41-36. Antic hit back with a pair of triples to put Olympiacos in front. However Antic committed an unsportsmanlike foul on Karaman, which led to free throws from Karaman and McCalebb and a 44-42 edge. Spanoulis pulled up for a triple to even the score at 45-45. Sato scored twice around a Papanikolaou triple, which had some inadvertent help from Batiste going in. Before long Spanoulis tied the game at 51-51. McCalebb shined with a drive through the Reds defense. Papanikolaou countered with his fourth three-pointer of the night before netting a layup that made it 53-56 through three quarters. Peker rediscovered his scoring tough with a pair of buckets to put the hosts back in front. Onan followed with a layup. After a timeout, Kyle Hines’s tip-in drew the visitors within 1. However Onan was just getting going. He drilled a triple and took a steal in for a layup to get the arena jumping. After Savas rejected Papanikolaou, Olympiacos appeared to be on the ropes, 64-58. Perperoglou nailed a three for the Reds, but a confident Onan answered in style. Preldzic’s steal and assist to Savas made it 69-61 with five minutes to go. 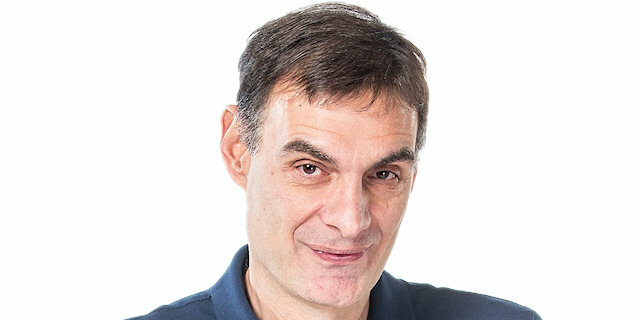 Printezis managed a nifty layup-plus-foul and Peperoglou added a jumper to trim the gap to 3. Printezis kept the Olympiacos comeback rolling before Spanoulis completed it with a three-pointer, 69-71 with two-and-a-half minutes remaining. 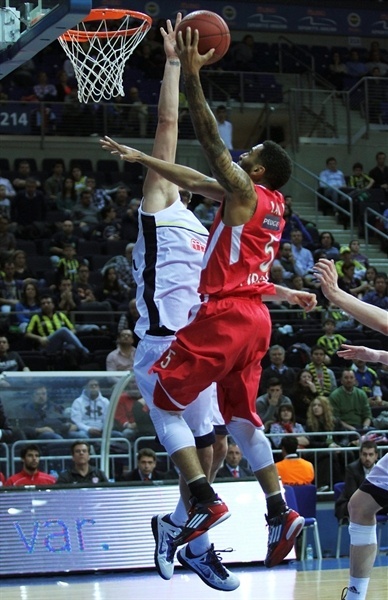 Hines picked a Prledzic shot out of the air and Law capped a 0-13 Olympiacos run with a triple. McCalebb gave the hosts hope with a layup, 71-74. Onan missed from downtown with 29 seconds to go. Spanoulis split free throws with 22 seconds to go. The hosts missed twice on the ensuing possession and Printezis iced the game from the line. "Tonight we won a very crucial game against a very tough team. They were leading by 8 points in the middle of the last quarter, but we showed character on the court and managed to win. In the last weeks of the group matches every game is like a final. Our players had too much pressure on their shoulders and need motivation. We have played against a very talented, skillful team. Now the key is in our hands. We have the last game at home. I congratulate my players and wish success to Fenerbahce Ulker." "It was a game which we could have won. We made some small mistakes in the last quarter and it cost us the game. We did everything to win, but failed once again in the last minutes. There is nothing to do but to congratulate Olympiacos for their win." 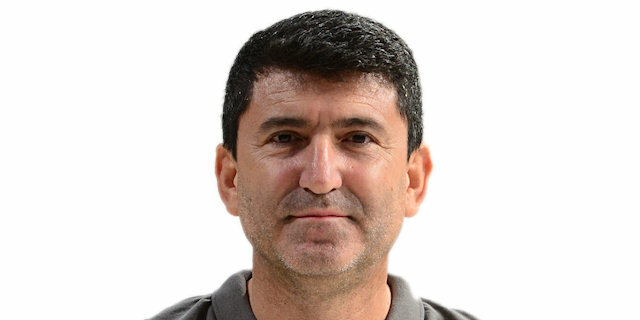 "Fenerbahce Ulker was suffering this season and taking this game was a good chance to recover their morale. But we need to win to stay alive in the group. So those details made the game an excellent one. We used our experience and managed to come back by 8 points. İt's good to chase for the playoffs."